[MBTI General] What house were you sorted into on Pottermore? [MBTItm] What house were you sorted into on Pottermore? Thread: What house were you sorted into on Pottermore? What house were you sorted into on Pottermore? Also, do you think that was accurate? If not what house do you think you really belong to? Pretty sure I'm a Hufflepuff although I was hoping for Gryffindor. It's better to be hated for who you are than loved for who you're not. I'm not a huge Potter fan, but I have taken the test. I got Hufflepuff too. It makes sense because I am loyal, especially to my beliefs. I'm INFP, so I guess that is why. I would prefer to be sorted into Ravenclaw but I'm not sure I'm smart enough for them, so Gryffindor or Slytherin will do. I think the Hufflepuffs would drive me crazy. Said Gryffindor, "We'll teach all those with brave deeds to their name." Gryffindor students are typically brave, daring, and chivalrous. Notable members include Harry Potter, Ron Weasley, Hermione Granger, Albus Dumbledore (head of Hogwarts), Minerva McGonagall (head of Gryffindor), Godric Gryffindor (founder of Gryffindor). Said Hufflepuff, "I'll teach the lot, and treat them just the same." Hufflepuff students are typically fair-minded, loyal, honest, and hard-working. Notable members include Cedric Diggory (competitor in the Triwizrd Tournament), Ernie Macmillan, Hannah Abbott, Pomona Sprout (head of Hufflepuff), and Helga Hufflepuff (founder of Hufflepuff). Ravenclaw students are typically intelligent, witty, and creative. Notable members include Luna Lovegood, Cho Chang, Padma Patil, Filius Flitwick (head of Ravenclaw), and Rowena Ravenclaw (founder of Ravenclaw). Said Slytherin, "We'll teach just those whose ancestry is purest." Slytherin students are typically cunning, ambitious, and resourceful. Notable members include Draco Malfoy, Vincent Crabbe, Gregory Goyle, Tom Riddle (Lord Voldemort), Severus Snape (head of Slytherin), and Salazar Slytherin (founder of Slytherin). I've been sorted into Hufflepuff and Ravenclaw on Pottermore before, but it seems like I'm more of a ravenclaw. I wish I was a hufflepuff, though. Why can't I be both? That would make me a ravenpuff. Could have sworn I've already posted in this thread. Slytherin by what, I don't remember. Like I've said I thought I posted my results over two weeks ago. 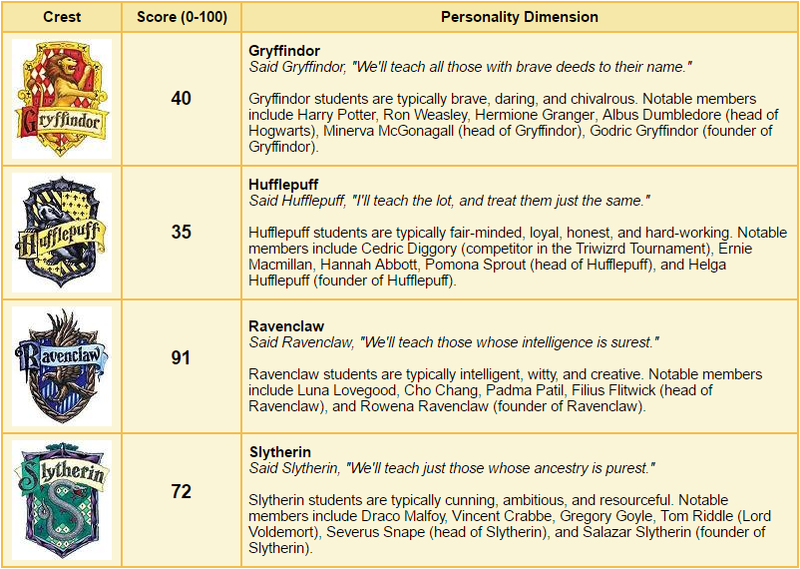 Not Pottermore, but I also got Hufflepuff at one point. Before it was Gryffindor, too. I thought you guys might like this. What house did you get sorted into on Pottermore? what bands did you grow up on? What Philosophers Were You Introduced To As A Kid? Harry Potter Fans: What House would you feel you best align with?